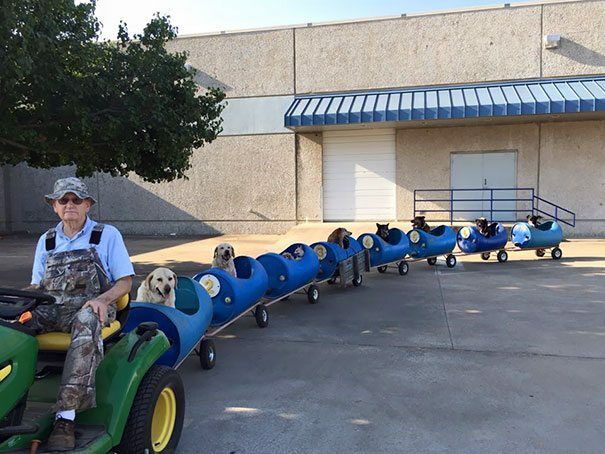 When your dogs are too tired, you build a train for them, right? CUTE PICTURES!! MADE MY DAY. Some very efficient ways to assist your dog, notably #10, #17 and #29……. Love the idea of the windows on the fence. Plan on putting bubble windows on mine. My two German Shepherds are going to love it, as my Sam and Ginger are very noisy and just love to know what is on the other side. Thanks for sharing. Very moving. Pets are our kids. I can’t imagine what some of them go through. It sickens me. We adopted two little girls last year. They were slated to be “put down”, such a sanitized way of saying killed. Luckily, my girls were rescued from a southern California pound by “Wiggley Tails” a local rescue agency. These girls had been together all of their lives (2 years). So, we decided to take them in, and thank heavens we did. We have never laughed so much and snuggled so much before the girls were made a part of our family. I can’t imagine that these wonderful girls might have been killed. I am now a proponent of rescuing and adopting animals. So many need adopting, now. Thanks for letting me share my story. And thank YOU Kimberly for rescuing! I happen to be wearing my “live, love, rescue” t-shirt from the aspca now! We adopted our little girl from an Idaho shelter (also about to be ‘put down’) and our little boy from one in Utah. They are only 3 weeks apart in age and could not BE more different, but oh the love!! We have windows in our fence also, but we put screen in, this is really cute! I wonder where they got the curved windows? So when people in the woods see the dog they won’t think it’s lost. #21 is great but does not work for regular sized dogs. Our kids are “medium” as we have a miniature Aussie and a Border/Aussie, so they are 35 and 45 lbs respectively. Everything is fairly low except our bed so I worry about them jumping off of it all the time so we tried steps, then a ramp, but they ignored them both and still just jumped down! So I give them fish oil with Omega to protect their joints. I’m a dog lover of all breeds but especially Golden Retrievers, Austrian Retrievers. My current dog is an Golden Retriever and Austrian Retriever x and he is 14 years old and having problems walking now so some of the things you showed would work for him in the future. Loved all of the items you showed, they were AWESOME. Will you look at the smile on the face of the top photo!? lol!! I love it. Thank you for such nice pics, i dont have a dog anymore, our Carmel died, ( Chihuahua) but i walk our friends dog here in Switzerland, and i feel Carmels spirit in Ollie( Australian Shepard) . GOD BLESS ALL ANIMALS, and their owners! PLEASE JUST BE GOOD TO THEM ALWAYS, Thank you. MICHAEL OO.?????????? Love almost all of these….too many to name a fav. I do have an issue with the dog bowls in the cabinet….the water should be available at all times and this looks like it can only be gotten when the food is put out.